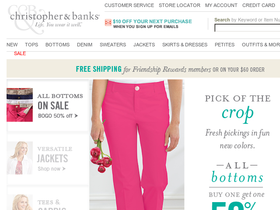 Christopher & Banks, online at christopherandbanks.com, is the online shop for stylish women's clothing. Christopher & Banks offers a selection of apparel and accessories in chic, classic, and contemporary styles. Christopher and Banks carries fashionable denim and jeans, sweaters, cardigans, jackets, skirts, blouses, work wear and casual wear, dresses, pants, scarves, jewelry, and much more. Christopher & Banks also offers great styles in petite sizes. Plus, Christopher & Banks offers fantastic savings. So before you shop, be sure to get all the latest christopherandbanks.com promotions, Christopher & Banks discounts, and Christopher & Banks coupon codes found here at RetailSteal.com. Christopher & Banks ships within The United States, including Alaska and Hawaii, Puerto Rico, U.S Virgin Islands, all APO/FPO addresses and Canada. Christopher & Banks offers standard and expedited shipping options. Some restrictions may apply. See site for more information. Click our link to shop online at Christopher & Banks today and save 40% on 1 full priced item. Use coupon code. Save $25 on your Christopher & Banks purchase $100 or more. Click here for coupon code and save. Save up to 60% or more in the clearance at Christopher & Banks. Click here to shop and save. Save $10 when you create an account at Christopher & Banks today. Click to start saving. Enjoy free shipping from ChristopherandBanks.com on your purchase $60+. Shop now and save. Get a $10 discount from Christopher & Banks when you sign up for emails. Click here to get started and save. Shop for dress pants, starting from only $19.99 from Christopher & Banks. Click here to shop. Save $20 off orders of $50 or more with this promo code when shopping at Christopher & Banks. Excludes clearance items.